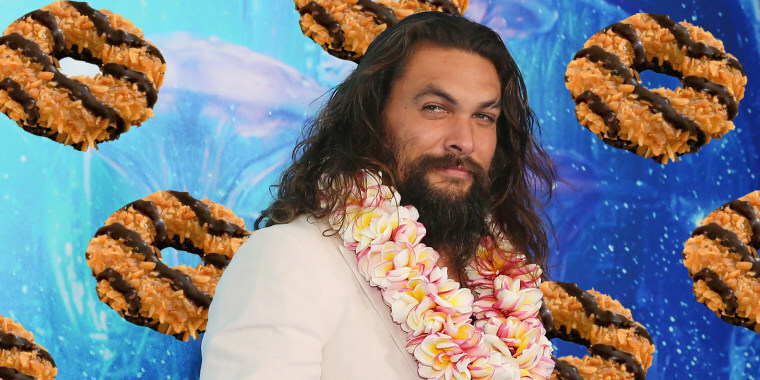 A Colorado-based Girl Scout printed photos of "Aquaman" star Jason Momoa on cookie boxes. And they're selling like hot cakes. Samoas are among the top-selling Girl Scout cookies each season but one crafty girl has found a unique way to sell even more boxes of the popular treat. Charlotte Holmberg, a Girl Scout in the fifth grade from Highlands Ranch, Colorado, may exceed her reputation as her troop's Top Cookie CEO — the title a Girl Scout can earn for selling a lot of cookies. In 2018, Charlotte sold more than 2,000 boxes. And now she is upping the ante. With new inspiration, Charlotte got to work recreating the delicious treat's packaging with a pic of the "Aquaman" star. The mom and daughter duo reprinted the classic purple Girl Scout cookie boxes with a large photo of Jason Momoa on the front of the box and retitled the cookies "Momoas." They promoted the boxes on social media to catch the attention of hungry moms and kids craving cookies. And so far, it's working like superhero magic. "The moms are getting really excited and they're saying that they need them!" Charlotte told Denver's 9News. "The girls will wanna buy some because he's on the front. And the boys will also wanna buy some because he's like, he might be like they're favorite character." Now, fans of Mamoa and Samoas are all kinds of excited about the combo. Mamoa on a Samoa, all kinds of delicious in this picture! People want to buy a lot of them. Others have promised to order truckloads ... as long as Momoa himself delivers the goods. A few followers of the Girl Scouts of Colorado Facebook page, which reposted the photo of Charlotte's cookies, were not as excited. Small feuds broke out in the comments from mothers who didn't "need" a box of Momoas, and said they thought it was "inappropriate" and a double standard to promote cookies using a shirtless man. "I doubt ANYONE got permission to do this," one person wrote on Facebook. "Objectification has always been a one way street. If the Boy Scouts put Victoria Secret Models on their popcorn cans people would flip their lids." "Ugh. So not appropriate," another said. But most commenters found Charlotte's redesign humorous and clever. "Oh my gosh people calm down. This little girl sold lots of yummy cookies. I'm sure Jason would find it funny. It's certainly not going to hurt him. Please back off the 'sexist' comments . If she had used a cute little kitten or bunny there'd be no comments but the boxes wouldn't have sold as well. I call it smart," one person replied in defense of the idea. This isn't the first time a Girl Scout has thought outside the cookie box when it comes to trying to boost sales. One Girl Scout set up her stand outside of a legal marijuana dispensary in San Diego and sold all of her boxes in less than an hour. Another created a kid-friendly remix to rapper Cardi B's hit "Money," which even got the approval from the artist herself. Momoa hasn't posted anything about seeing his very own box of themed cookies on social media. Hopefully for Charlotte, he'll place a few orders when he does.